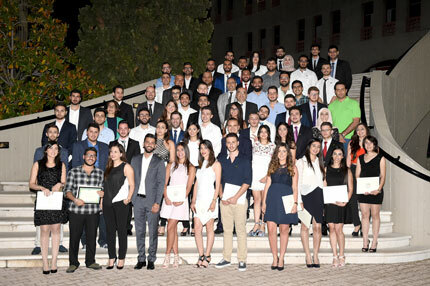 Over 80 students — who excelled in and out of the classroom — were honored during LAU’s School of Engineering Awards and Distinction ceremony held at the university’s Byblos campus. The school’s Dean George E. Nasr congratulated the students and expressed his utmost gratitude for their hard work and accomplishments. “This is one time when we get together, as faculty, staff, students and parents, to take pride in the academic harvest of our honor students, and this year the harvest is plentiful,” said Nasr. However, it was not just being a recipient of an award that makes the ceremony so special. “The true value of this ceremony does not lie in getting the award as much as it does in earning the reward of success,” explained Hagop Jamkojian, the holder of the highest GPA (4.0) and winner of the $1,000 award. The role parents play in the their children’s lives is one that should not be taken lightly. “Your parents have worked so hard to give you the best, and no matter how hard life was they continued to make sacrifices over the years to pave the way for you to become who you are today,” pointed out Nasr. Jamkojian also stressed on the important role played by LAU’s professors and their support to students. “In addition to being reliable sources of knowledge, our professors have always been solid sources of guidance, support and kindness. I would not be on this stage if it weren’t for their consistent support,” he said. “We are responsible for shaping the world and to help solve many of the global challenges such as climate change, energy issues, health, etc.,” said computer engineering major reminding his fellow students of the significance of being an engineer. Three teams won the prestigious school wide Capstone Project Poster Competition, in which more than 30 teams competed. 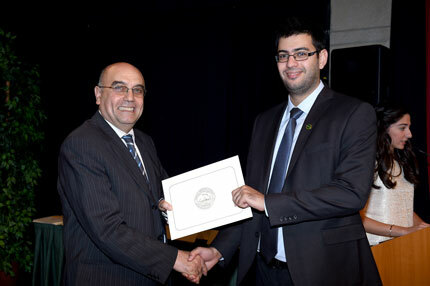 Ralph Abboud won first place based on the originality and quality of the work, and the presentation of his poster. All first three winners also won financial awards. The jury decided to give honorable mention award to three other teams. Stephanie Atallah won the Hasan Abdallah Yabroudi Civil Engineering Design Project Award, with Elise Mansour coming in second and Miriam Tawk in third place. All winners received cash prizes. 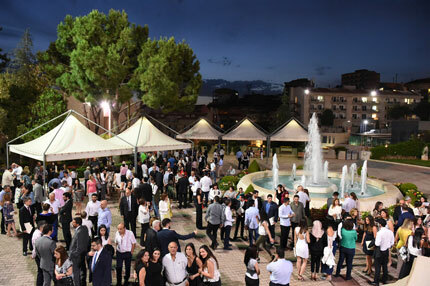 Yorguo El Hachem won the School of Engineering’s Dean Best Achievement Award in Civil Engineering, with Hanna el Khoury and Charbel Abi-Nahed coming in second and third place, respectively.. First, second and third place awards were given to students in the Computer Engineering and Electrical Engineering Departments as well. Assistant Dean and Associate Professor of School of Engineering Barbar Akle feels that although the cash prizes were not the motivation behind the projects, being rewarded often encourages students to invest more time in them. “The most amazing part of being in academia is seeing and celebrating our students’ success,” he stressed. Akle explained that several Capstone Project Awards were given “because this is an experience which solidifies our graduates.” Students also earned Gold and Silver awards for the best Capstone Project in the Industrial Engineering Department and Mechanical Engineering Department and all award winning students received cash prizes. As for the parents, they were ecstatic with joy. “This gives encouragement and pride to the students for their achievements and future work while it gives us so much happiness,” said the mother of Karim el Khoury, who was a first runner-up for the Capstone Project Poster Award. Electrical Engineering Honor Student Russelle Mouawad’s father, Antoine, echoed Khoury’s sentiment saying the awards gave encouragement to the students. “These students today have an advantage on others intellectually, and I think everyone should feel honored,” the elder Mouawad said. All awards recipients can be found on the school awards site.